Meet Elizabeth and Dawn, the newest members of our Library Foundation Street Team. In addition to helping us out in the office, Elizabeth and Dawn will help man our Library Bike Store at the evJunction every Saturday from 10:00-1:00. 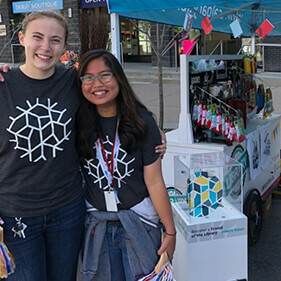 This summer, we’ll also be wheeling in to the East Village Street Fair (July 1), Inglewood Sunfest (August 4) and Marda Gras (August 12) so don’t forget to stop by if you plan on attending any one of those events. CMLC’s evJunction is an innovative shipping container shopping hub that has become a fantastic community gathering space. The Junction is located just around the corner from the New Central Library and will be open Friday-Sunday until September 3.